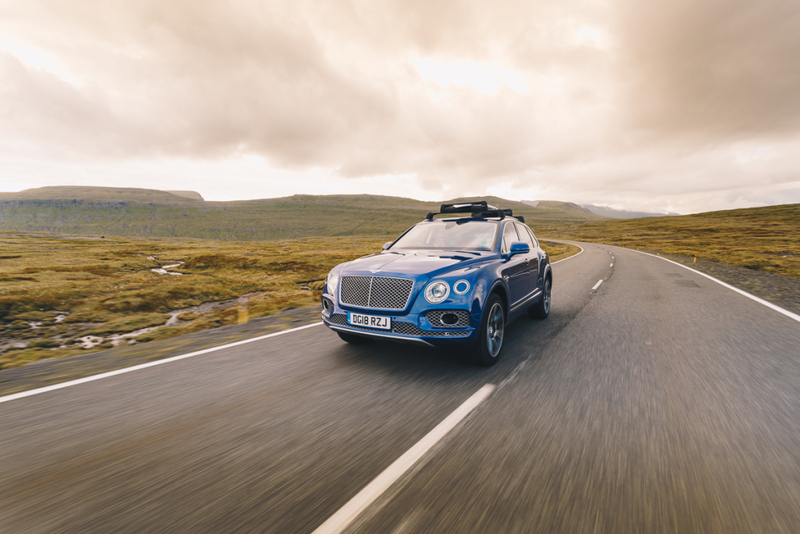 “Faroe Islands, Bentayga, can you make it?” Not the most descriptive of invitations we’ve received, but the email contained just enough eyebrow-raising keywords to warrant delving a little deeper. It just so happens, a Sequin Blue example of the planet’s coolest SUV is currently making its way home from Iceland via a dirty weekend on the Faroes. Not ones to pass up the opportunity of a two-day jaunt in three tonnes of 542bhp powered prestige people carrier, we hastily accept the offer, more than happy to explore one of few countries left unvisited by Flat-Out’s collective passport. We reply with an equally enigmatic, “Alright then”. 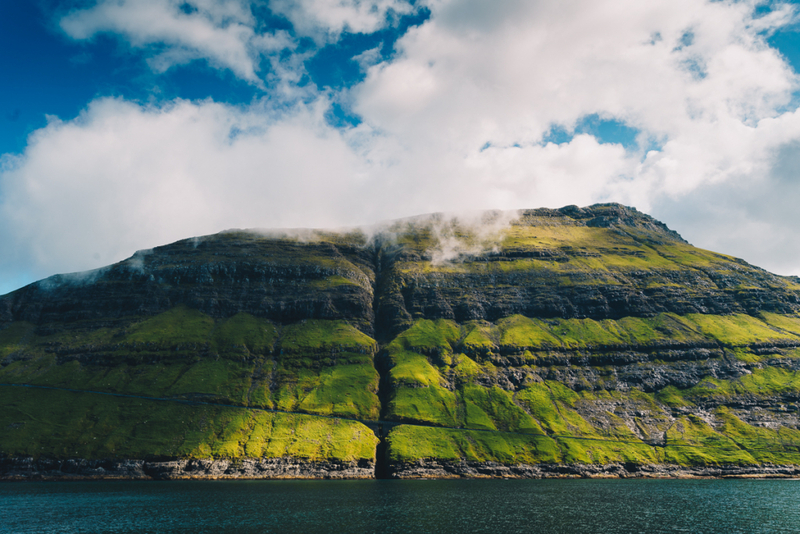 For those of you who haven’t found their way to Wikipedia just yet, the Faroe Islands are part of an eighteen-piece archipelago that juts strikingly out the North Atlantic. Sitting midway between Norway and Iceland, the seemingly isolated islands are home to 50,000 or so Faroese, a self-governing territory within the Kingdom of Denmark, discovered by monks, conquered by Vikings and occupied by the British just long enough for fish, chips and Dairy Milk to take root. Sounds like fun. Regular readers of these pages may have noticed that one or two Flat-Out pencil pushers like to consider themselves surfers. Regular readers that paint themselves with the same brush will know all too well that, with such a label, comes an unavoidable curiosity. 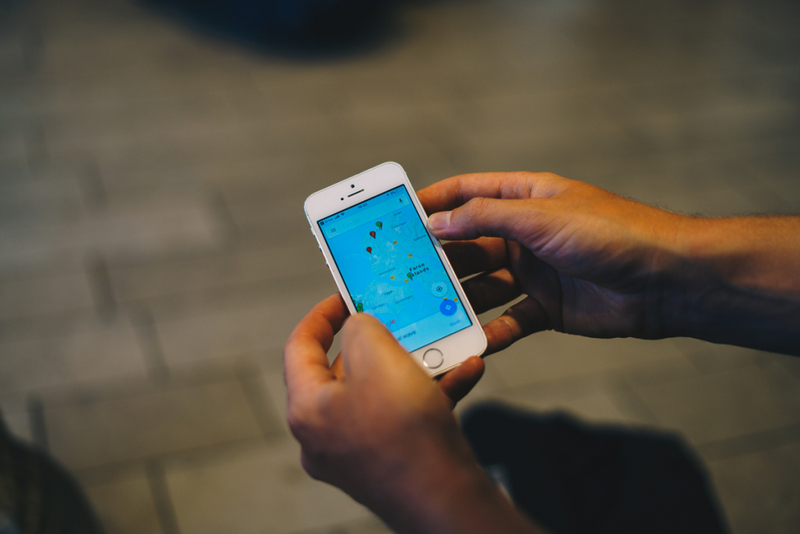 Whether you’re you’re a seasoned pro or an overly keen white water weapon, any unvisited country with a coastline warrants the “Hmmm, maybe I can surf here…” Google session. Well, we’re no different, and as it happens the Faroe’s endless nooks and crannies are more than capable of offering up a decent wave, should the nations unpredictable weather decide to play ball. 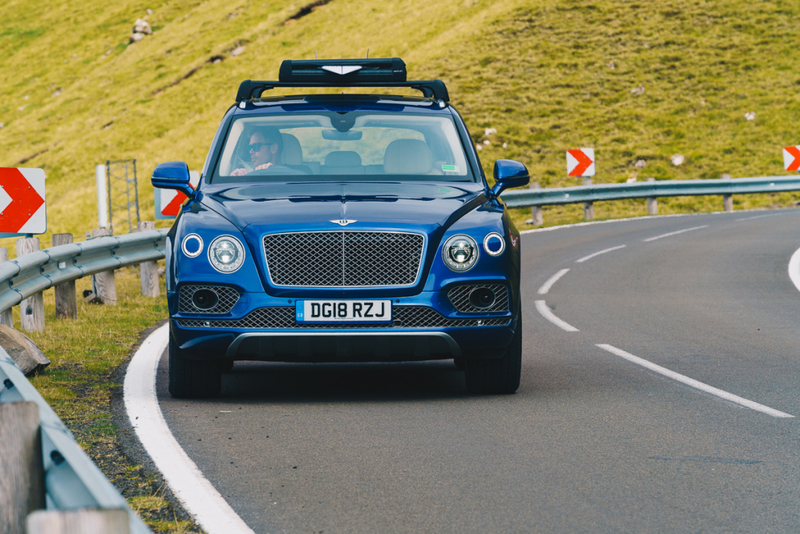 Trouble is, while we might be able to tell you that the V8 engined Bentayga’s 0 to 60mph time is less than half a second behind its V12 cousin, that despite its four-cylinder diet and two-litre reduction in displacement, the 40kg lighter five-seater uses its 770 Nm of torque to march effortlessly to 180mph, all while wearing a significantly lighter price tag, we’re just a little bit rubbish at the whole pressure system, swell direction, surf hunting game. Luckily, for every one of us petrolheads, there’s a seasoned surf explorer willing to ride shotgun while studying maps and poring over swell charts. We enlisted Brit surf explorer and all-around nice guy Mark “Egor” Harris along for the ride, all in the hope that we might sniff out a wave or two while we’re island hopping through the North Atlantic. Mark happily accepts the chauffeur-driven ride from Newquay to Heathrow. We load up with plenty of rubber, a bag full of boards and hope for the best. Our journey to this far-flung land begins somewhat ironically at the end of our own record-breaking heatwave. As if Mother Nature was preparing our sun-kissed skin for a visit to somewhere with a notoriously damp climate, the skies decided enough was enough and unleashed three months of pent-up precipitation on the east side of Heathrow’s Terminal 5. With thick black clouds surrounding London, our two-hour hop to Denmark is delayed just enough to ensure we miss our connection to Vagár, the archipelago’s only airport. 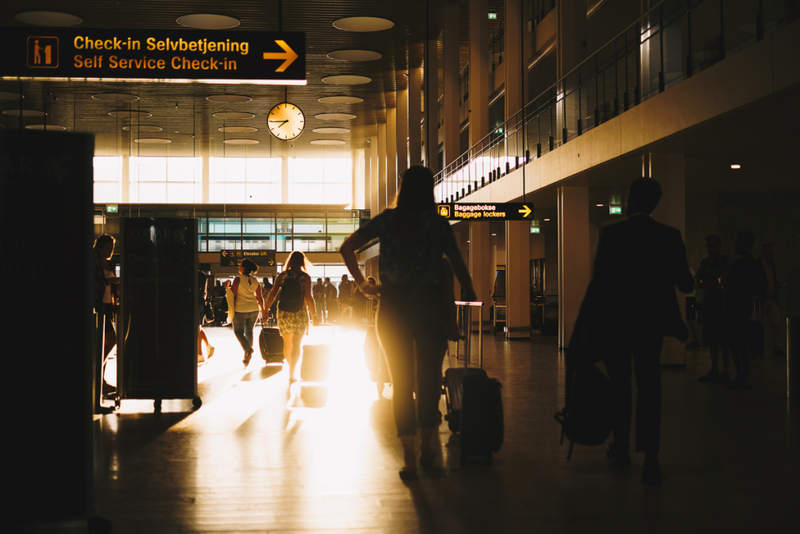 Our route takes us via Copenhagen Kastrup, although each leg covers far more miles than the distance between the UK mainland and our destination, it’s still the easiest way for us southerners. 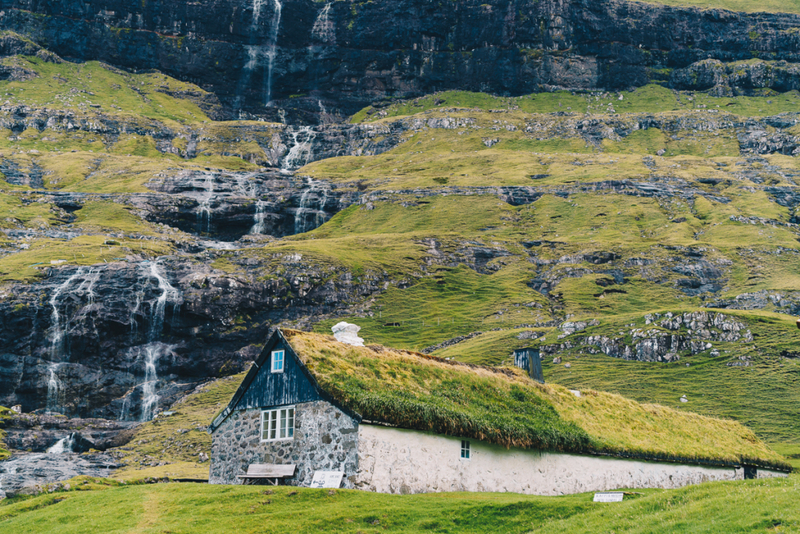 British Airways, Easyjet, Norwegian and SAS fly daily to Denmark from London, making for plenty of options before you jump on one of two scheduled Atlantic Airways jets to the Faroes. SAS offers flights direct from Edinburgh, an easier option for those nearer the border. 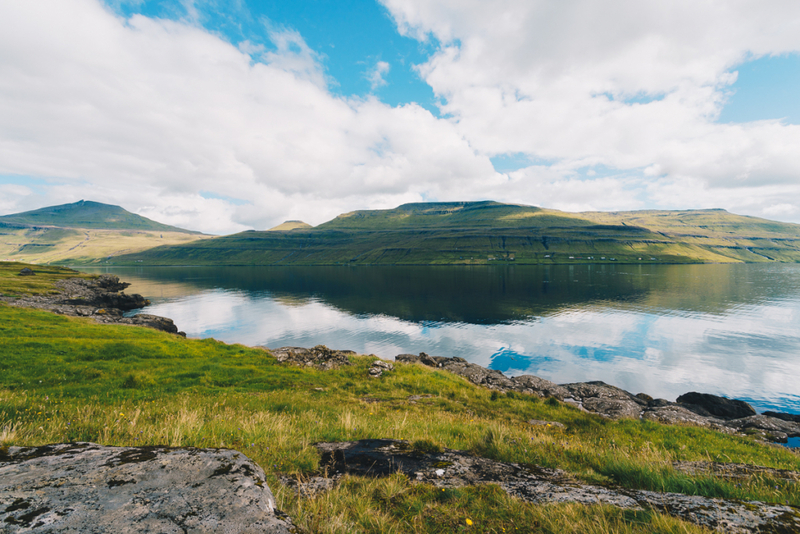 If you fancy experiencing the Faroes with your own set of wheels, a two-night ferry from Copenhagen is a lengthy option, but has the potential to make a for an epic road trip, should you continue west to Iceland. But for this excursion, time is of the essence, and we’re already behind schedule. “I hope you like clouds and rain!” jokes our Danish concierge as we wearily drag luggage into our hastily arranged hotel. Despite his somewhat sarcastic statement, he confirms he’s never actually visited The Faroes. “The emergency Br-exit is just behind you” he continues. Quite. 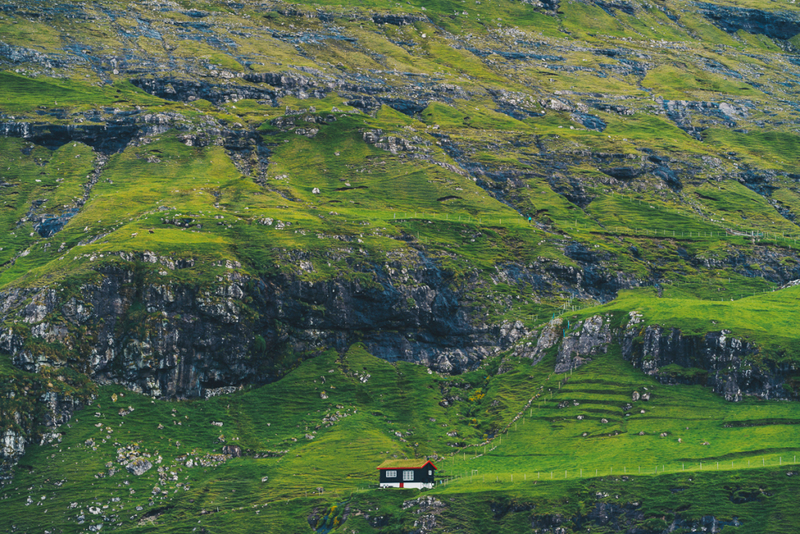 It seems that most people like to paint a bleak picture of the Faroes, but the islands are actually blessed with a relatively mild climate for their latitude, which fluctuates very little throughout its seasons and although the weather can be somewhat unpredictable, we eventually land at Vágar airport to nothing other than glorious sunshine, clear blue skies and the mildest of summer breezes. Rolling out of the airport carpark, it doesn’t take long to realise just what’s so special about these islands. Grass-covered, tree-less landscapes fluctuate between deep valleys and impassable craggy peaks every few miles. Each twist and turn in the pristine roads reveal a further abundance of cascading waterfalls and sheer rock faces. Vast lakes and rivers are sporadically lined by red and black grass-covered cottages whose hamlet-sized clusters almost blend into the sheep-grazed plains that surround them. 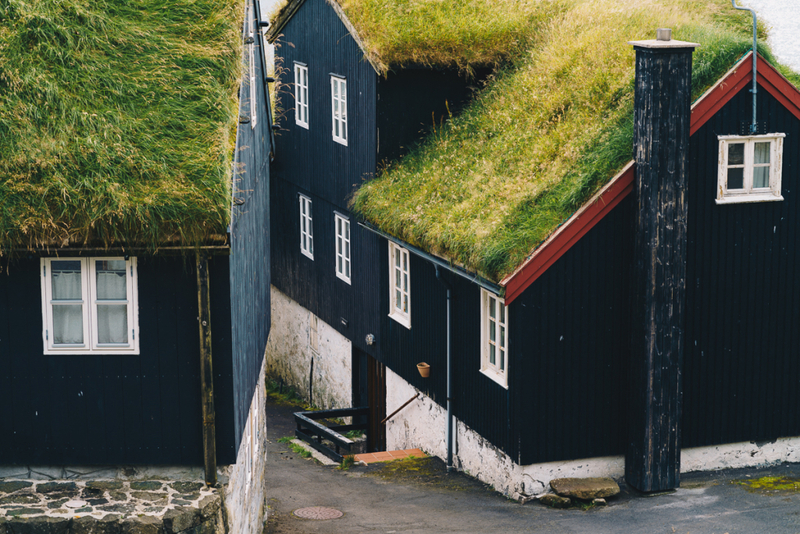 We make a beeline for Tórshavn, the country’s capital, a short drive away on the neighbouring island of Streymoy. With our potential surf spots meticulously researched, plotted and downloaded, we propose on making full use of our only full day on the islands by hitting a couple of locations that are most likely to deliver ridable waves, with our first potential swell magnet being the small town of Tjørnuvík. Although the tiny cove is located only 50km north of the capital, the mountainous landscape does throw up a few obstacles, mostly in the form of impassable 400m high rocky outcrops. 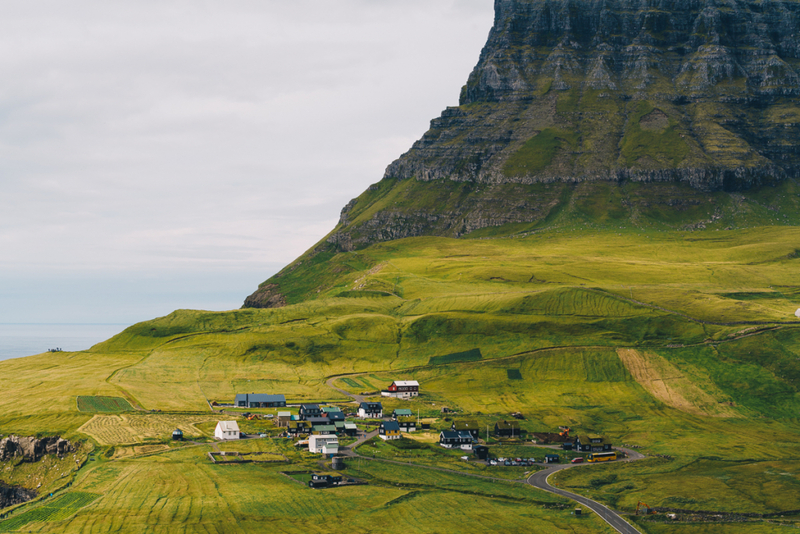 Luckily, the Faroese have been on a continuing crusade to keep their 18 volcanic islands as connected as possible. Over the last 50 years, the locals have built and burrowed over twenty tunnels, bridges and causeways, effortlessly connecting towns and villages that would have previously only been arduously accessible by foot. Ranging from late-sixties, single lane, roughly finished and unlit mountain shortcuts to 150m below sea level, 3km modern masterpieces (that will set you back €15) – it’s hard to imagine how the locals used to get around. 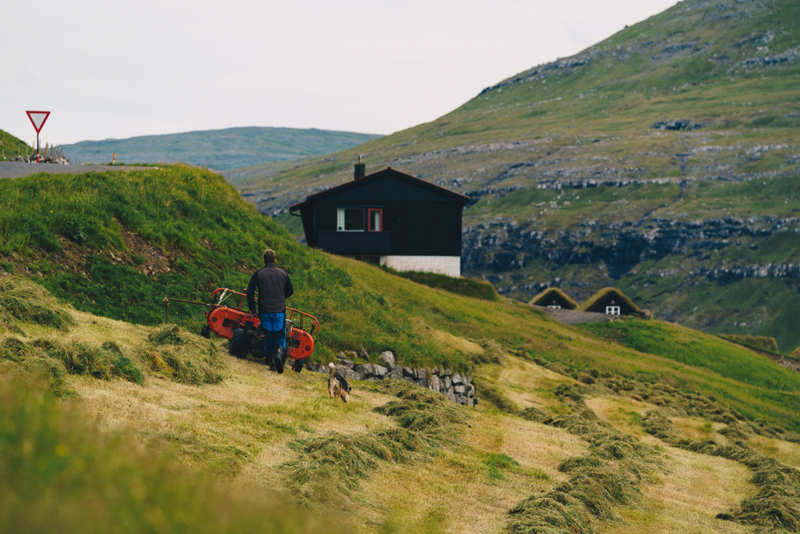 In fact, the Faroese have a word for stopping points where they can rest the coffins of their dead, harking back to the days when a team effort was the only way to transport their relatives to their final resting place. Thankfully those days are long gone (although there are still helicopter “buses” to the most inaccessible parts) and a kilometre long tunnel helps us make out way to Tjørnuvík in just under an hour. 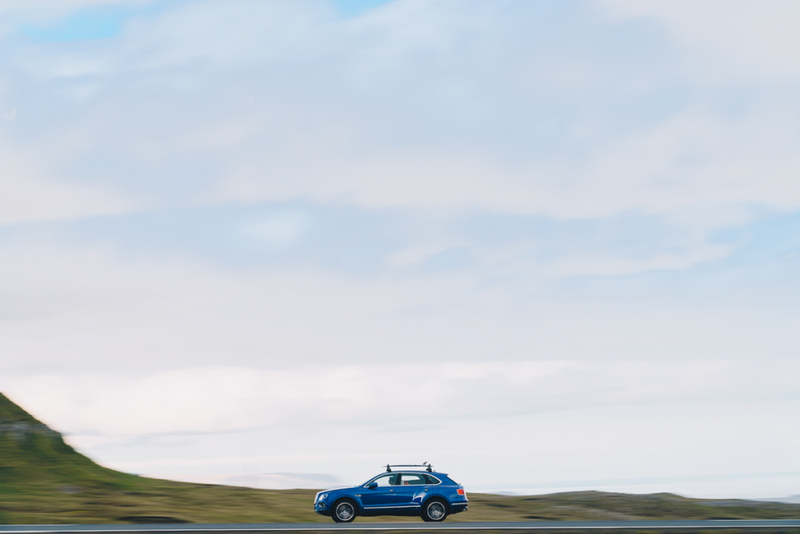 After hugging the east coast of Streymoy, we descend into Tjørnuvík down a dramatic single carriageway road, hundreds of meters below the ever familiar towering mountains that disappear into the clouds above. It’s obvious as soon as we approach the grey and white beach that we won’t be surfing here today, nothing more than a ripple rolls into the bay. But the sun’s out, and it’s attracted a handful of people to the small coffee shop that serves the village’s 71 strong population, as well as the few surfers that pass by in anticipation of the cove’s promising beach break potential. As we sit and look out into the sheltered bay, Mark explains how on a north northwest swell would produce matching left and right peaks on either side of the narrow beach. 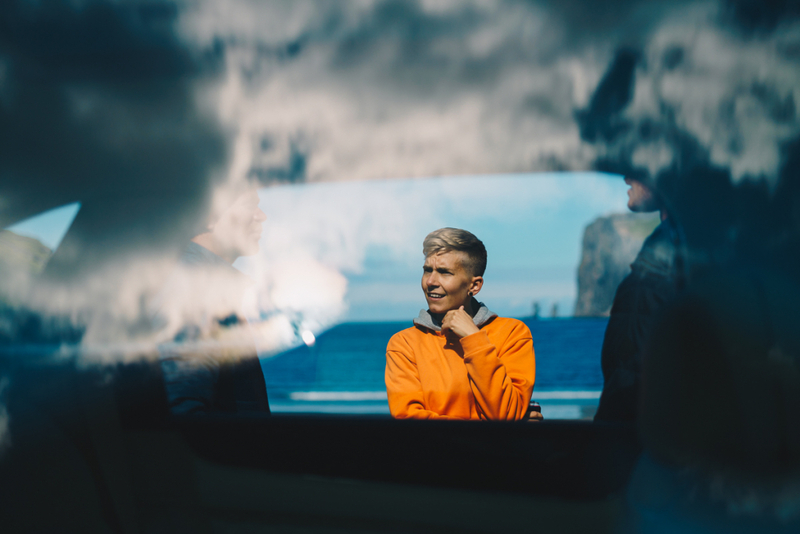 Overhearing our conversation, a Faroese local, Katrin, informs us that when it’s on, the waves break throughout the tide and even when it gets good you’re unlikely to find more than a handful of surfers in the water. Making the most of the unexpected sunshine with a local beer or two, Katrin explains that she is one of the country’s few regular surfers and while we shouldn’t be surprised by the lack of swell in August, we should be shocked by the big ball of fire in the sky that’s uncharacteristically keeping us out of hats and jackets, despite being in the middle of summer. 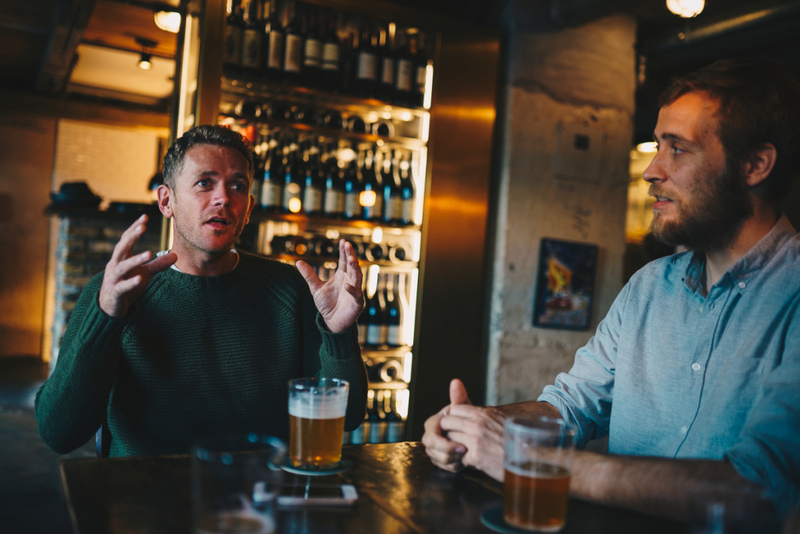 We chat for a while, as surfers do, about dealing with crowds, visiting surfers, storms, weather, when we should come back, when we shouldn’t and, more importantly, touch on the brief history of surfing on the Faroes. 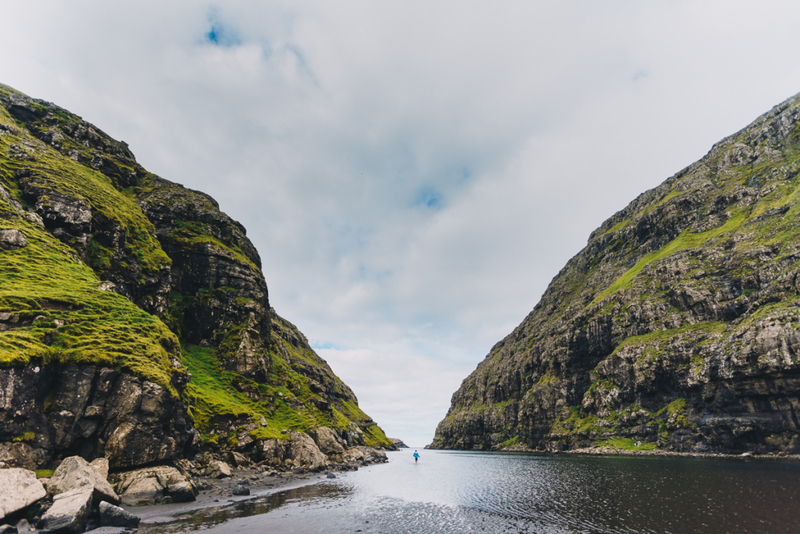 Keen to delve into the curious ocean culture that has evolved here over the last decade or so, we agree to meet later for a quick rundown on how the Faroes has become both a world-famous surf destination while remaining on the boundaries of surfing tourism. We leave Tjørnuvík on the only road out of the village, satnavs set for Saksun, an even smaller town on the west coast of Streymoy. We’ve heard that a low tide walk past the valley’s tidal lagoon might just reveal a perfect left-hander. It seems we’re not the only pioneers making the trip to Saksun. The local church here was originally built in Tjørnuvík way back in 1858. For reasons we’re unable to determine, perhaps it made sense at the time, the small brick structure was dismantled and carried, by hand, over the mountains we’ve just driven through, only to be reassembled in Saksun. 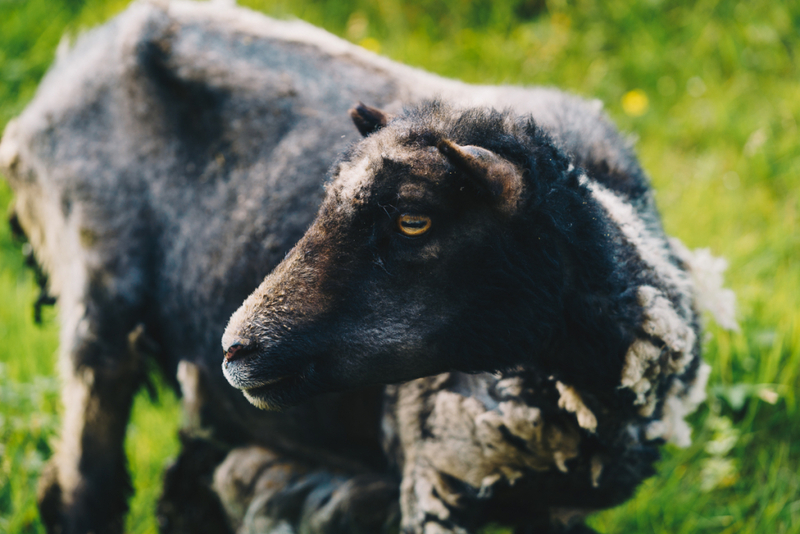 The church now plays neighbour to a café and a small museum-come-gift-shop located in a single seventeenth-century farmhouse known as Dúvugarður, belonging to a farm that still maintains a flock of over 700 ewes. Entertainment aside, Saksun finds itself at the mouth of a long forgotten natural harbour. Filled with sand by an un-dated storm, the inlet now plays host to a seawater lagoon. Our arrival coincides with a pushing tide and we’ve been told that we need to be quick if we want to make it to sea without being cut off by the fast approaching water. 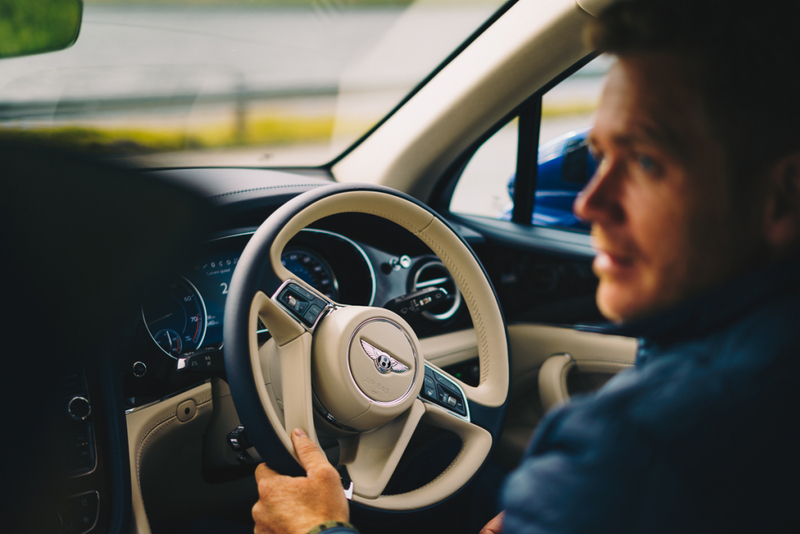 “I’m getting suited” Mark announces as he grabs his board from the roof of the Bentayga. If we only get one chance at making it to the ocean, he might as well be prepared. He means wetsuit of course, and it makes sense, there’s no point in making the 25-minute walk to the waves only to head back for surfboards and wetsuits. Mark runs ahead as we remove shoes and socks to wade through the small knee-high pools the filling tide produces. 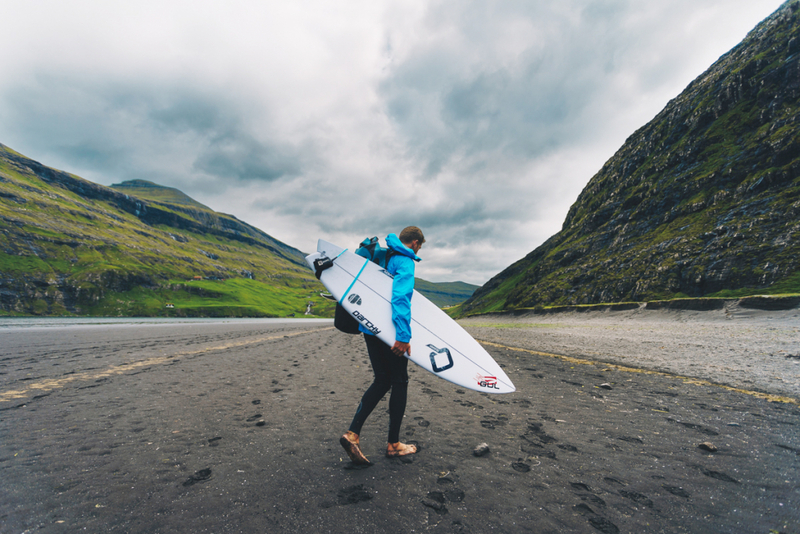 Feeling the seawater first hand is a frosty reminder that despite the Faroes’ relatively mild climate, it still boasts the Arctic Circle as its neighbour and anyone considering surfing is going to need at least 5mm of rubber and a decent pair of boots, even in high summer. Mark wades through the incoming tide and disappears around the outstretched headland. After more than fifteen minutes squinting at the horizon, we see him jogging back, board under one arm and his phone in the other. “It could be so epic” he exclaims as he starts to play a video on his phone. We watch a short video of a perfect, peeling left-hander break endlessly into the river mouth. He’s right, it is perfect, it’s just that today it’s only stacking up to be about six inches big. Excited nevertheless about our discovery we make our way back again to the car, we might not have got the waves we wanted, but we’ve certainly got something to be hopeful for. There’s a strange smell wafting around the car park upon our return. It’s definitely something edible, the small food truck gives that away, but it’s not anything our British tastes can relate to. “Six-month fermented lamb burgers” the owner of the trailer proudly announces. When in Rome, right? 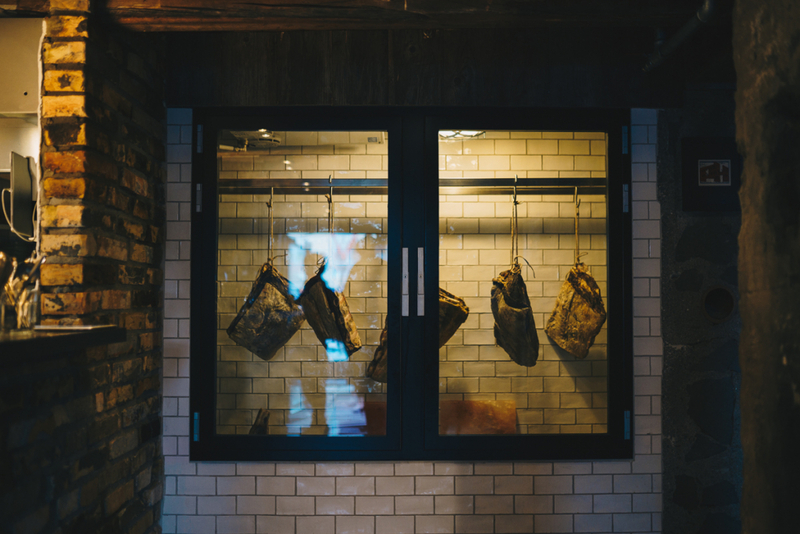 Skerpikjøt, to give its local name, is made by simply hanging sheep’s legs in a shed, for months at a time. I order mine with coleslaw, while the weaker stomached members of our party went for an un-fermented slice of pizza. I struggled for a while to compare its pungent smell and tangy taste to something a British palate might relate to, but I don’t think it’s possible. You’ll just have to give it a go yourself. 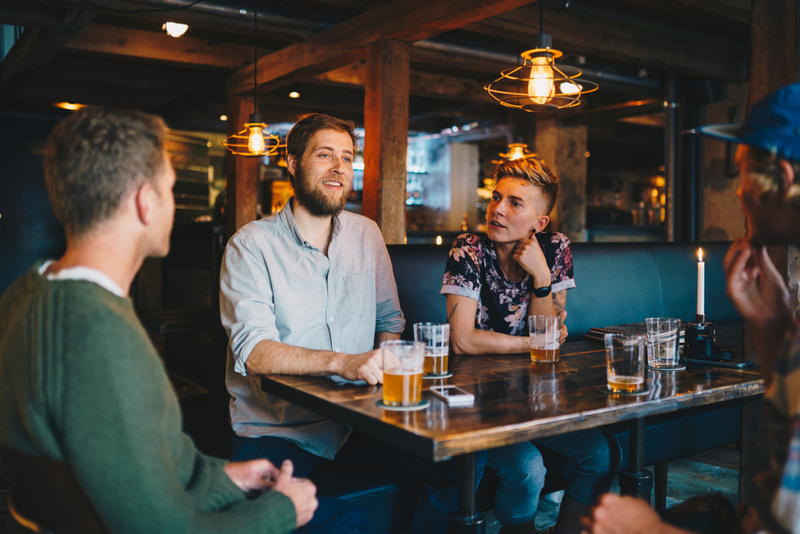 We meet Katrin at The Tarv, a grill house on the Tórshavn harbour. She arrives with David, who she quickly explains is the person who started it all, the father of Faroe surfing. We order all involved the local IPA, Gullhornið from the Faroes based Okkara brewery. “I never liked all the normal sports” David starts, “Football and handball were boring to me”. He explains how he wanted to enjoy what the Faroes could offer, the landscapes, the weather, the ocean. Windsurfing’s popularity in the 80’s have left a few local people committed to continuing the sport, and that’s what he picked up. Fast forward a few years and the popularity of cold water surfing has developed into a continuing search for the final frontier of ice-covered beach breaks. Pioneering photographers and hardy surfers have been exploring neighbouring Norway and Iceland, scoring deserted perfection and in turn, creating brand new surf communities in these once un-surfed regions. 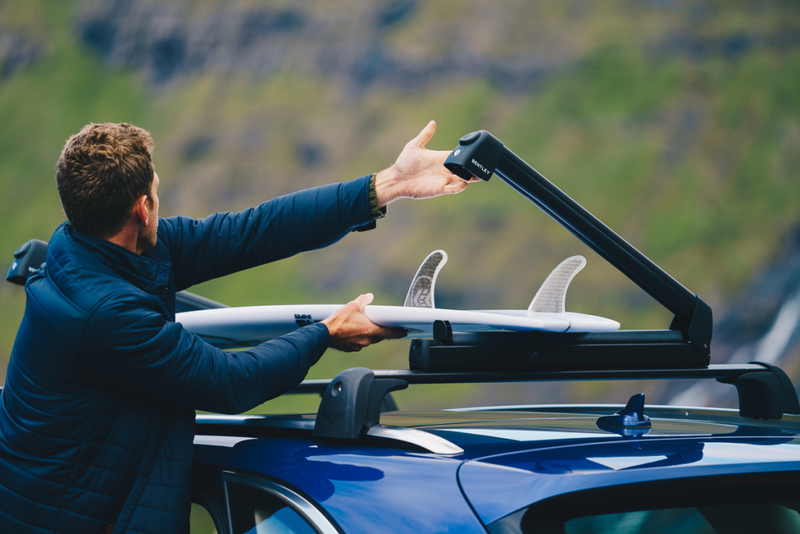 Left unexplored by wandering surfers until 2006, the exact birth of Faroes surf culture is still fondly remembered by David. David tells us he and Yassi became good friends. 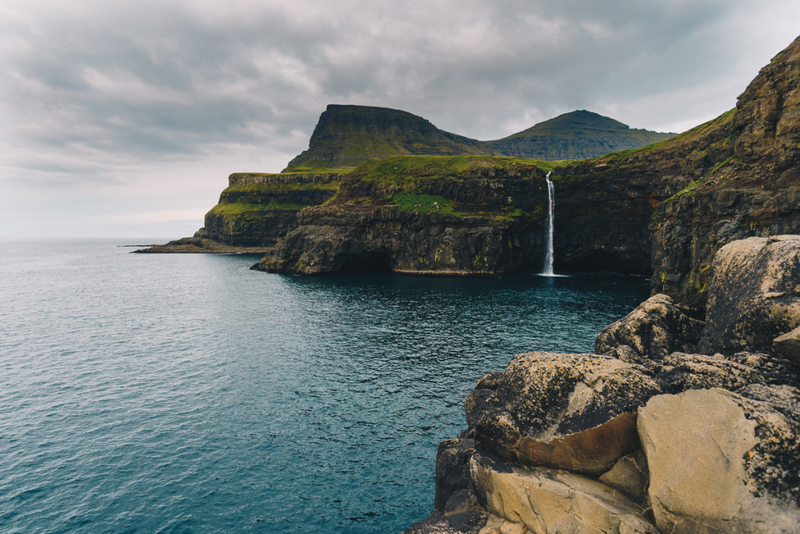 Ouhilal was on the hunt for the large, slabbing waves that he was convinced the Faroes could offer, which meant extended stay on the islands, scoping out the coastline on jet skis and boats. With a phonebook full of international surfers ready to make the journey when the storms arrived, Yassi would make the call and teams of American and Hawaiin professional surfers would descend at the same time as the waves started rolling in. Although keen to try surfing, David didn’t have many options, the only surfboards on the islands came – and quickly went – with these travelling surfers. Yassi encouraged David to the ditch the sail from his huge windsurf board and helped him get started with a few whitewater sessions. And that was that, David became the Faroe Island’s first local surfer. “And he had it all to himself until I started in 2014!” Katrin interrupts with a smile on her face. “They said you don’t know how good you’ve got it” David continues, referring to the American surfers. “Ten years from now this will be full of surf shops and wannabes”. Well, the prophecy hasn’t come true just yet, as the two people sitting with us consider themselves the country’s only regular surfers. 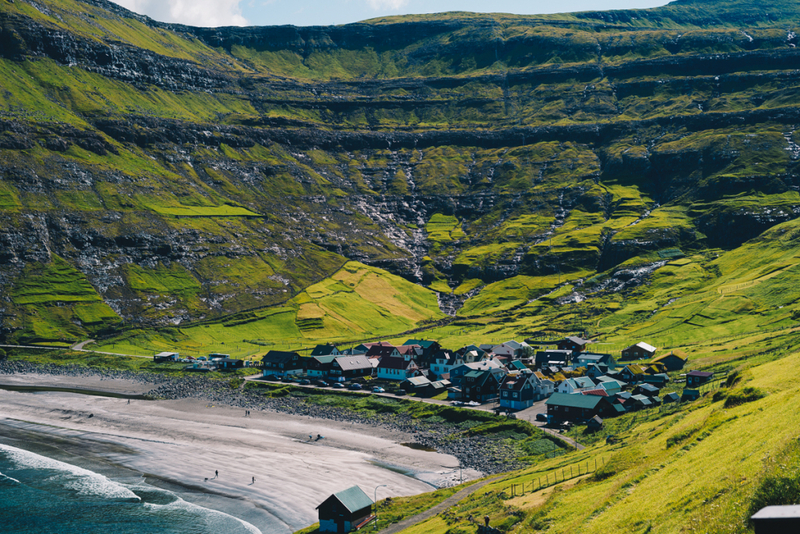 With many other facets of the worldwide surf press picking up on the Faroes potential, it wasn’t long before more wandering surfers put these islands on their Atlantic hit list. But the prospect of crowds doesn’t really worry these two. “It’s never busy, even when it’s good,” Katrin says “Surfing is hard, lots of people start off enthusiastic but give up when it gets difficult or cold”. Phone photos of our home breaks at their finest are shared and the ever-important social follows accepted. We take on a few more drinks but being rather exhausted from a solid day behind the wheel, we head to Hotel Havgrim, our boutique bolt hole for the night. 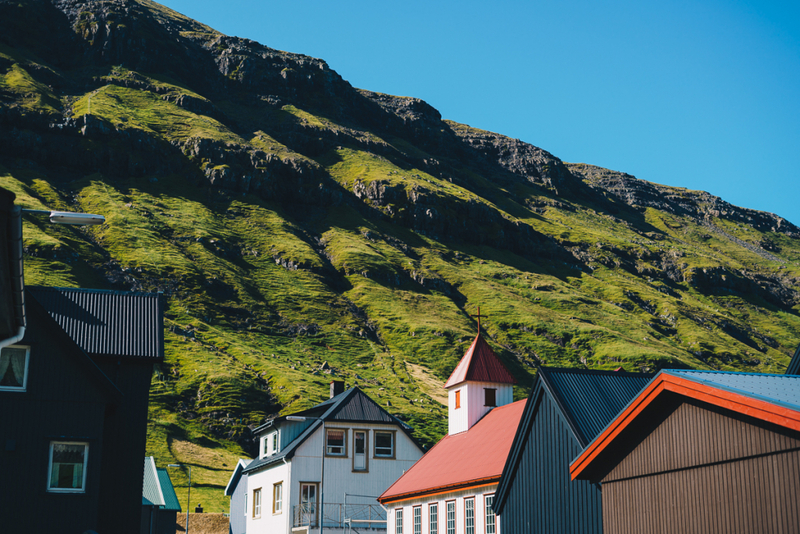 Right on the coast of capital Tórshavn and outfitted with fjord inspired decor, the comfortable beds and generous breakfast makes a perfect centralised resting place for anyone keen on exploring these islands. With our surf recce complete we dedicate our final hours to a bit of good old-fashioned tourism. 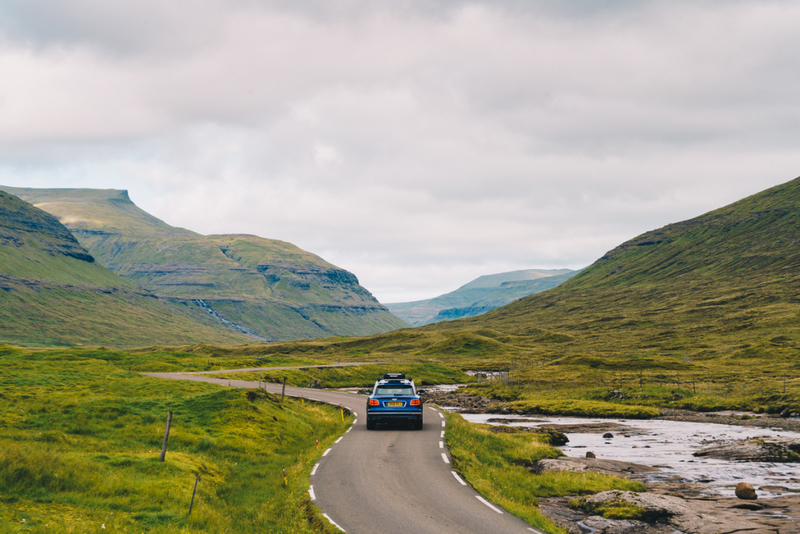 The nice guys at Bentley have done their research and linked some of the Faroes must-see hotspots together with some of the island’s most picturesque and interesting roadways. 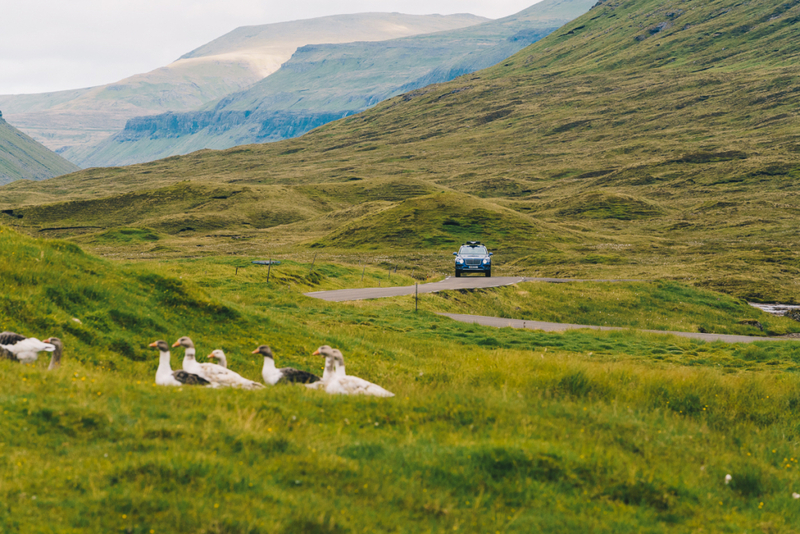 While the Bentayga was never given the opportunity to bear its off-road teeth (we’ve done that before, anyway), the long way round to Gásadalur, our final sightseeing stop, promises even more empty mountain roads, single lane tunnels and mindblowing landscapes, all served up with a side order of sheep, geese and ponies. 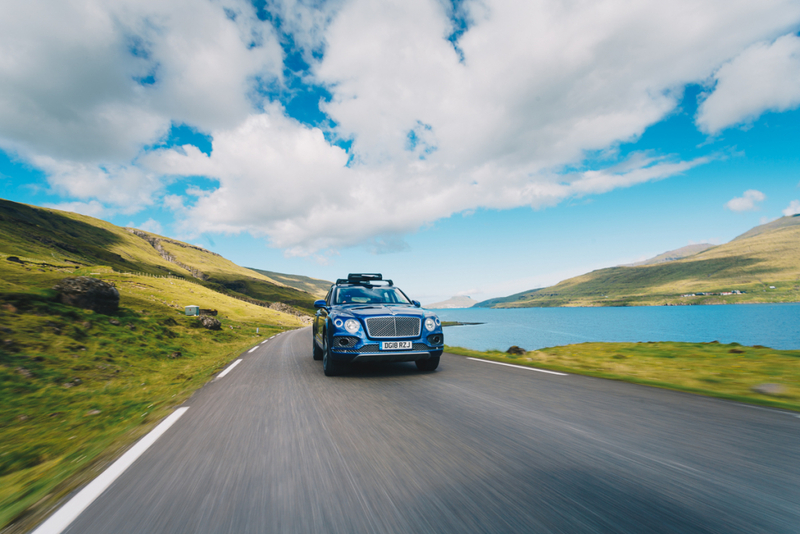 As the Bentley’s V8 roars its way through one more subterranean echo chamber, we emerge straight into the tight hairpin that marks our arrival in Gasadalur. 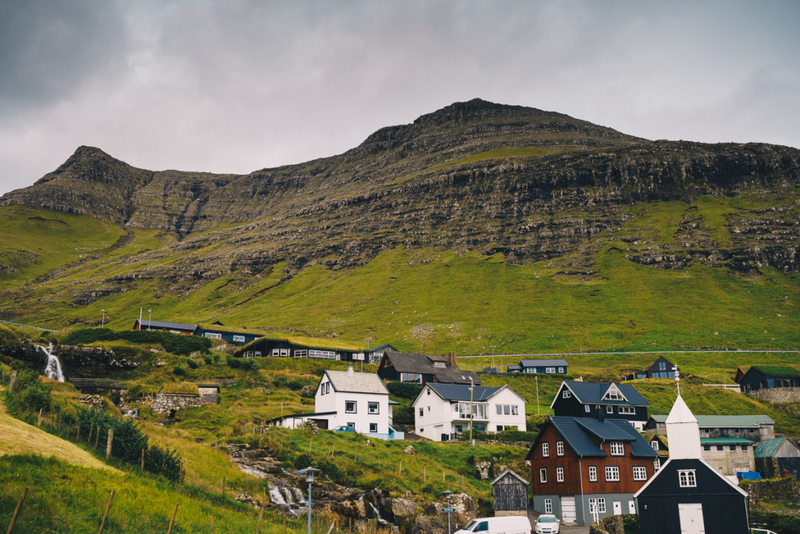 Surrounded by Vagár’s tallest mountain, the 700 metre high walls of volcanic rock have kept this town of 18 residents well isolated, even by Faroe standards. Up until 2004, when the freshly blasted tunnel allowed vehicular access, the only way of leaving – and therefore interacting with the rest of the population – was a strenuous hike over the 400m high peaks that separate the village from neighbouring Bøur, where they were forced to keep their boats. Long way to go for a spot of fishing and a chat. The highlight of this diminutive dwelling is its impressive 65-metre waterfall. Surrounded by hundreds of puffins and an entire encyclopedia’s worth of seabirds I don’t recognise, this now easy to access beauty spot is a must for anyone, no matter how short your stay. It’s only an 18-minute drive from the airport. While we might not have scored the conditions we were hoping for, we didn’t come away empty handed. Not only did we had the opportunity to experience a place few surfers have visited, but we also got a pretty good idea of how the craggy cliff faces and sheltered beaches of this wonderful country work. We’ll be keeping a beady eye on those Atlantic low pressures over the next few months, and next time you see the Faroe Islands mentioned on these pages, it will almost certainly be accompanied by a healthy dose of picture-perfect point breaks and solo barrel sessions in front of dramatic, snow-capped landscapes.